At Dragon*Con 2012’s WoT costume contest. 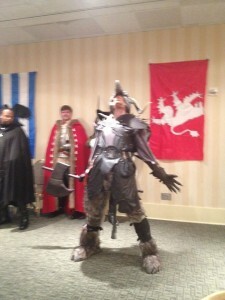 So the origins of this costume date to JordanCon 2011. Chip, Kelsey and I were sitting around (most likely drinking a bit) when we decided it would be really exciting to do a massive group costume. 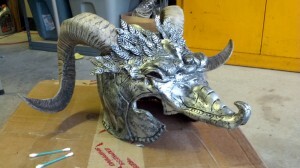 We wanted something that would really wow people when they saw us, something beyond your normal Wheel of Time costumes that you see every year at JordanCon. And so we settled on Trollocs. One of the coolest parts of the costumes is that we could be the same, but different. Or maybe different, but the same. I guess it depends on how you look at it. 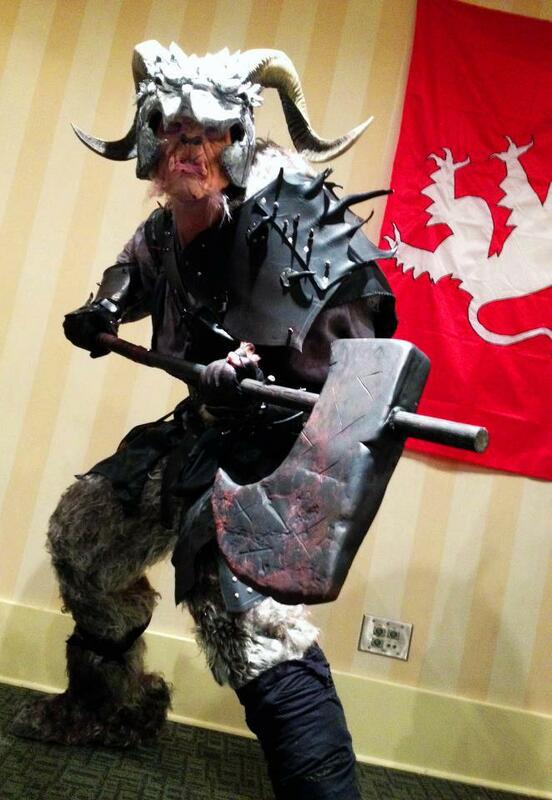 We could each put our unique spin on what we thought Trollocs should be, but we didn’t have to worry about not looking “right.” We could each focus on the parts of our costumes that really excited us, but without concern that someone might have a better weapon, or armor, or whatever. It was very easy for to make each costume our own, but still maintain a uniform cohesion amongst our costumes. For example, Kelsey loves doing make-up and prosthetics. 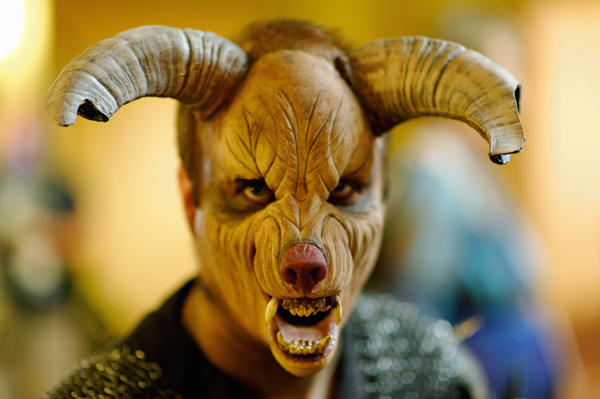 So he wanted to focus on his mask and horns that were attached to his skin! And so his focus was on making those believable and seamless. And he also hand wove his own chainmail (not something that I would ever care to do!) On the other hand, I knew that I really wanted to reproduce the Trolloc helmets that are seen on the Darrell K Sweet book covers, especially Fires of Heaven. I always loved the design of those helmets, and the way that you could just see hints of the monsters underneath. The cover art of Robert Jordan’s Fires of Heaven, book 5 of The Wheel of Time. Kelcey Casson, Paige Gardner, Chip Moore, Paul Bielaczyc as a fist of Trollocs. We completed these costumes right before JordanCon 2012. As a group we won 2nd place in the costume contest. In the time between JordanCon and DragonCon, I decided to upgrade my costume a bit, including adding dirt and blood for a worn, weathered appearance, and most importantly adding a prosthetic mask and teeth to complete the appearance. And it paid off! Brandon Sanderson and the other judges at the final Wheel of Time Costume Contest at Dragon*Con 2012 awarded me First Place. Woo hoo. But on the most important part of the costume, how I did it, and how you can do it too! Let me start with my new mantra that I learned with the CLU costume, and rediscovered with this one. Sometimes it is well worth spending the money to do it right, than to come up with crazy plans to try and save a few bucks. Oftentimes you will end up spending just as much money, and a ton more time, to make something that isn’t as good (not always, but a lot of the time). Let’s just start with the best part, my helmet. This was my main focus, and the part that honestly took the most time, and had the most of my attention and care. The helmet consists of about 5 or 6 different materials/parts, all built and designed for durability and strength. This is the basic list of what I used. You can read the article that I had written exclusively for the helmet here. The mantra continues with the armor too. We talked about making the armor from craft foam and glue. However, two things taught us better. 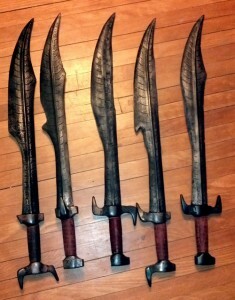 First, my brother had made craft foam armor for his DragonAge 2 Hawke costume. He had significant problems with durability and riveting the pieces together. And second, Kelcey tried it. I planned to tell everyone about the problems at our first meeting, but Kelcey had decided to make a sample shoulder piece to show us at the first meeting. He had spent 4-8 hours (I can’t remember the exact amount of time) to make the smallest of shoulder pieces. That was way too long, especially since some of us needed full chest armor. So we decided to make all the armor out of leather. Actual, real, dead cow. Sure we would have to spend about $150 on a whole side of black leather. But between the three of us, we would have a thick, durable, and easily workable material to make all the armor. Most of our pieces were patterned with poster board, which gives you a good approximation of the rigidity of leather, and then completed in leather. We decided that for the sake of realism, rather than painting the leather to look like metal, we would just leave it as black leather armor. We wet-molded a bunch of leather pieces to form spikes, since the Trollocs are described as having black spikes on their armor. These were typically riveted onto the leather. For me the best part of using leather is that I can toss it around, stuff it into a Rubbermaid, and all it will do is add weathering and use to the armor. I don’t have to worry about a piece of craft foam tearing, or getting crushed, or getting warm and losing its shape. I just toss it in and go! 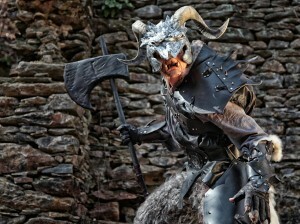 The battle axe was actually re-purposed from my Twisted Wizard of Oz Tinman costume. 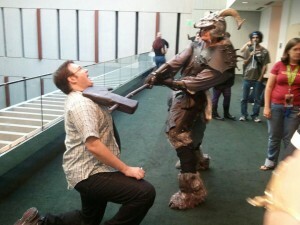 I didn’t really plan to wear that again, and I thought, Trollocs can have massive axes larger than any man would carry. Why not? Since I never wrote about it for that article, here’s how I did it. I started with a 4 foot long, 1 inch dowel from Home Depot (a full list of materials will follow the tutorial portion). I cut it in half, and using a dowel screw, I put the dowel back together, just at a slightly bent angle. Then I carved the head of the axe from some sheets of insulation board that were glued together with Gorilla glue. I then mounted the axe head onto the dowel, using some hidden screws to solidly attach it. The next process was to coat the foam with a 2-part urethane from Smooth-On called Shell Shock. You mix it up, and have about 3-8 minutes of working time (depending on the type you get) to apply it to the foam. I did about 3 coats total. Next I got an orbital sander, and sanded the axe head until it had a nice smooth surface. This step was not fun, and the head was not nearly as smooth as I would have liked it to be, but in the end I just said, meh, it looks more hand crafted than machine made. Lastly was to paint it. I used dark browns and blacks for the handle, and black spray paint for the head. I then used an old paint brush to splatter blood over the head and the handle. Oh! There was one final step. I wrapped the handle with leather strips from Tandy to give it a comfortable grip. Paints: spray paint, craft paints, etc. 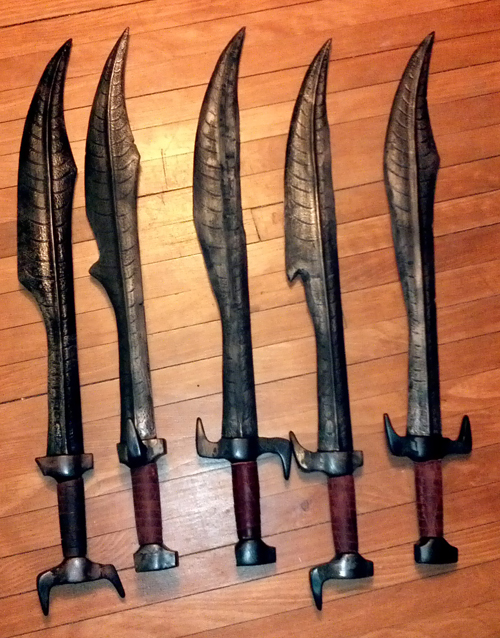 Following the policy of “same, but different,” I purchased a set of five foam blades that are recreations from the movie “300.” I then took a dremel, sander, and saw to them, altering each one just slightly so that they retained a similar feel, but each had its own unique look. After shaping them, I painted them using a flat black spray paint, and then silver Rub-n-Buff to do a light silver rubbing over the whole blade. The final step (same as the axe) was to wrap the handles with leather straps. The best part about using foam blades is that they are con-friendly, so I get the look of steel without getting tacked at Dragon*Con! Early photo of the gauntlets. Haven’t added many of the fine details yet. 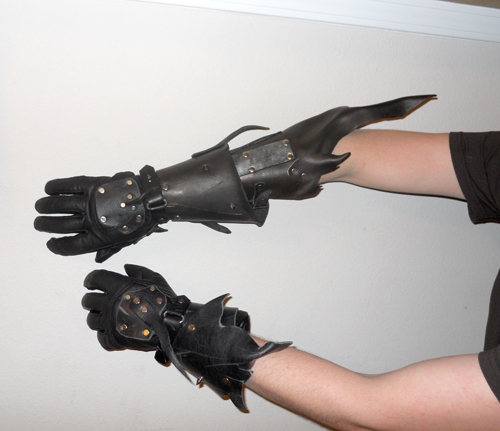 The gauntlets were originally a pair of motorcycle gloves that I found on Amazon, which were then heavily altered. After replacing the Velcro wrist straps, I also added rigid leather cuffs, rabbit fur, leather and metal spikes, as well as faux metal plates on the cuffs as well. The right arm has a bracer that is put on first, with the glove that overlaps the bracer for a plating effect. I also cut out portions of the finger tips, sewing in bits of fur and claws. 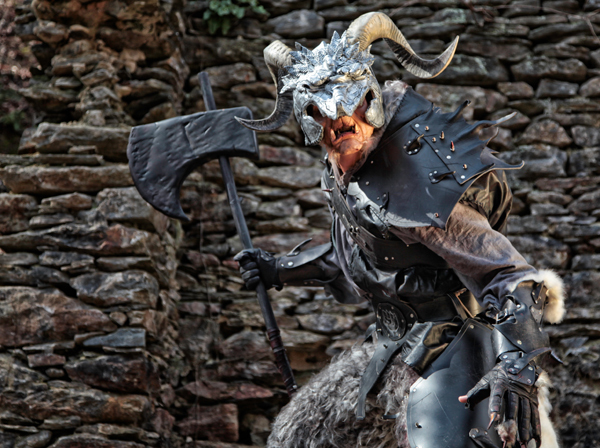 The hooves, which are available for everyone now, were sculpted specifically for this costume. Since I have such huge feet (size 15! ), I knew that I wanted something larger than our standard satyr hoof, and something with more detail. The hooves were then attached to a cheap pair of shoes with various adhesives (you can see my how to on that on the Deluxe Hooves Page). Between JordanCon and Dragon*Con, I didn’t have time to sculpt my own mask. 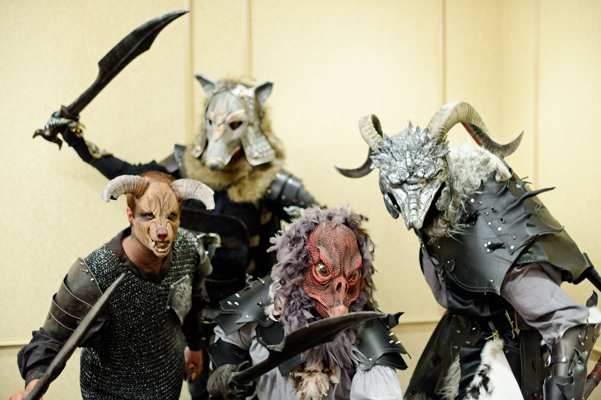 I attempted to buy a mask that was an altered human/boar, but the mask company wouldn’t answer my emails. So I went back to a company that has always been reliable, Bone Yard FX. I went with their Royal Beast, and well, made mine WAY creepier than what is pictured on their site, lol. Starting with the foam latex appliance, I first coated it with castor oil. After applying a thin layer of castor oil, I proceeded to paint it with Graftobian brand RMG make-up, the same make-up that we sell on our site. 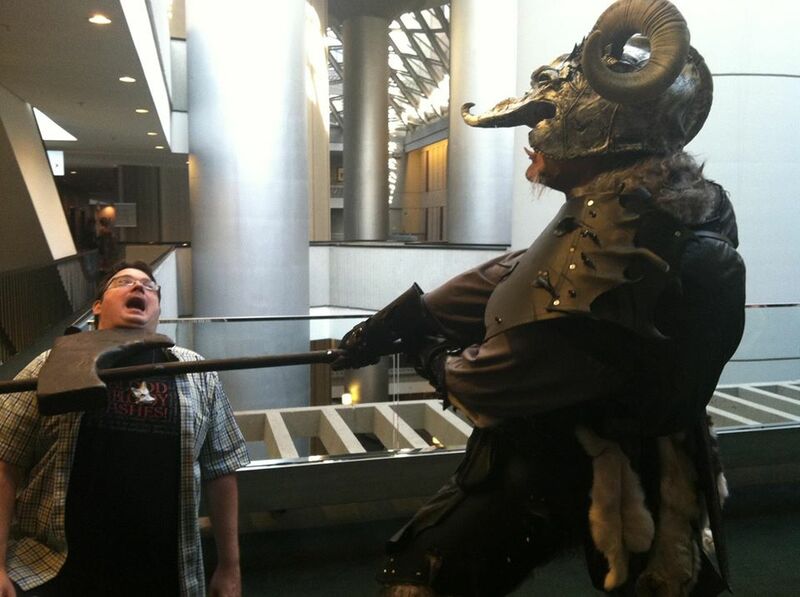 I didn’t need to use the plastic horns that came with the mask, as the helmet would cover that portion of the mask anyway, but I also didn’t want them for my particular breed of Trolloc. 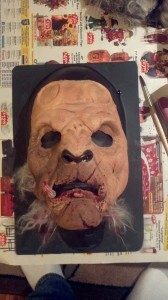 After applying paint, I then scarred the lip, added blood, and glued some fur along the edges of the jaw. This helps disguise the seam line of the jaw so that you can’t see where the mask ends. Most of the other seam lines are hidden by the helmet. I am also wearing a set of dental veneers along my lower teeth, though I can’t recall where I purchased them! The furry pants are just like what Aradani offers on our website, except made with some fur that we all hated, and so it otherwise would have gone to waste. However once the pants were made, a nice brushing made the fur look much better! Inside the pants I attached wedges of foam both on the thighs and on the calf to create a more animalistic curvature of the leg. The shirt was an older Ren Faire shirt that I never wore anymore. I mounted a large hump of foam into the back of the shirt, covered with more of the fur. I did this in an attempt to make my body have an inhuman shape to it. The vest was garment leather that was roughly handsewn to give it the appearance of something made in a rushed manner. The stitching is not uniform, some goes in and out, others around the edge. For me it was the small details that no one would ever notice. I patterned the vest out of large pieces of craft paper, stapled together. I must have reworked the pattern 5-6 times, needing significant amounts of added material to accommodate the hump on my back. Finally there are a bunch of little accessories to complete the costume. I have a dirtied waterskin hanging from my belt. It was a great way to hydrated without detracting from the costume or requiring a handler. I also had many rabbit pelts hanging from my belt. And the last step was to give the costume the appearance of dirt, blood, and filth. I needed to ensure that none of the filth would come off, onto car seats, hotel beds, etc. So I put the costume on our mannequin, and then splattered it with burgundy and brown paints, as well as dusted it with appropriate spray paints. If you look at the group photo at JordanCon, my costume is very clean (it looks like a costume), but the later photos are much dingier and dirtier. And that about covers it! This is probably one of the most elaborate costumes that I have put together. I have worn it now at about 5-6 shows total, winning Best in Show at MidSouthCon in 2013. For me, the best part of the costume is that I can put the entire thing on, by myself, in about 30 minutes! Now taking it off, that’s another story. 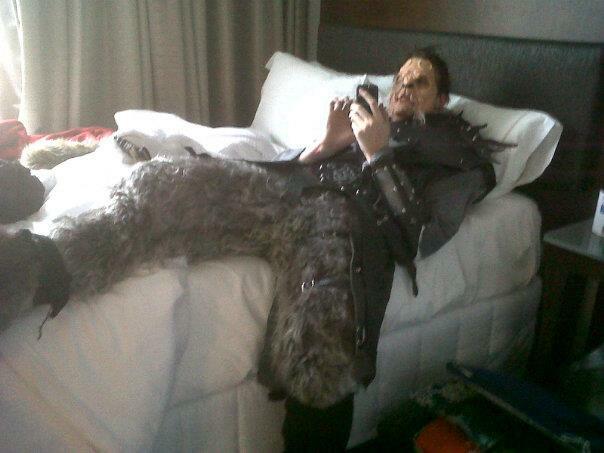 Being lazy at Dragon*Con, playing on my phone. Upon learning that I won the Wheel of Time costume contest at Dragon*Con. Brandon Sanderson was one of the judges. And one last amusing story to share. When we went to Georgia for the photoshoot with Dim Horizons, we were prepping in the parking lot. One of my nostrils was glued on crooked, and I was having trouble breathing through my nose. We drove in Strangeway’s car, so bending over to look in the mirror was difficult. We were parked next to an SUV, so I just used the rear passenger window to adjust my nose. Well, about 3 minutes later, a gentleman comes off of one of the trails, giving us odd looks, especially the giant monster that is standing among the normal folks. He walks about 10-15 feet past us and past the SUV, when he turns around and quickly bolts back to the SUV, climbs in, and hurriedly backs up to leave. It is at that moment that we see a lady sitting in the passenger seat of the vehicle. She had been in the SUV during my adjustment! 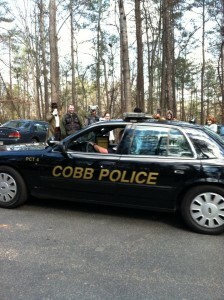 Cobb County Police were called on me. There were reports of “monsters in the area.” Look at Paige’s face though. Perfect shot! Well, about 5 minutes after that a cop car pulls up. Matt and Nicole say this is a common occurrence. Cop drives by, sees odd costumes, comes to investigate. 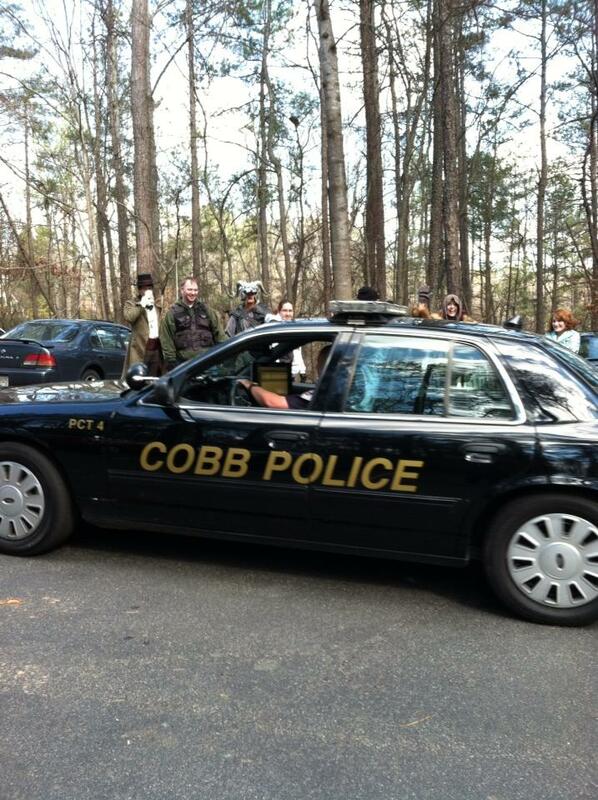 However they knew something was wrong when the second cop car pulls up. Apparently, there had been a 9-1-1 call reporting “monsters in the area.” I kid you not, that is an actual quote from a police officer! So yeah, that little lady sitting in the car called the cops on me, I guess thinking that I might eat her… or something.